Namida no Soukoban Special (which roughly translates into Warehouse Keeper's Tears Special) is a game that was released for the Famicom Disk System in 1986 by ASCII Entertainment. By 1986, many of Japan's game players were familiar with Soukoban in one form or another since its introduction in 1982. 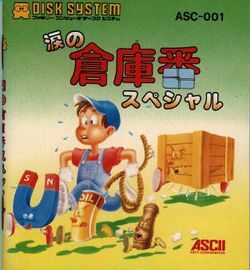 Rather than publish yet another version of the same old game, ASCII attempted to enhance the Soukoban experience for its debut on the Famicom by providing players with a unique set of tools that let players "cheat" in some fashion in comparison to the original rules. Objects like Magnets and Pulleys provided players with a limited ability to pull boxes, something which the original versions of the game prohibited. Objects such as these, or pepper, or oil, were discovered by pushing certain boxes that hid the items underneath. Progress through the game could be saved to the disk to prevent forcing players to solve puzzles that had already been solved. This page was last edited on 17 November 2013, at 22:25.